Note, a new absolute World Record SAW Speed has been set in November 2014 by Tyler Garrard - its now at 142.9MPH / 229.97KMH. Click HERE for a video. 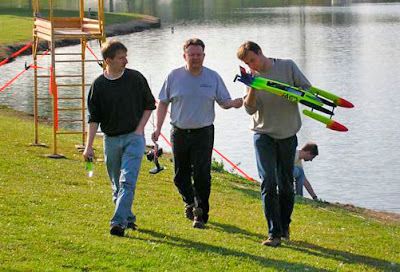 Joerg, Arne and Gunnar from German Team JAGS - the (former) fastest RC boat team in the world. Joerg, Arne and Gunnar from German Team JAGS did in 2006 the fastest one of all with a 140.36 MPH average (225.8 kmh) - thats also a national US NAMBA record. They use 32 cells in their class "T" hydro with a Lehner motor. I don't think they have run it after that record run 2 years ago. This is Grimm recently getting some air time, its just fractions before he crashes. 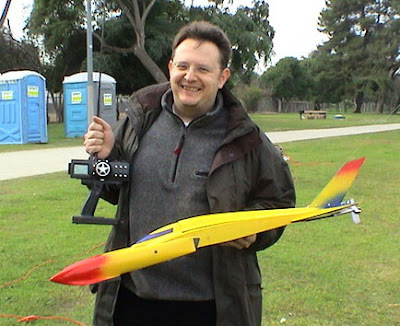 Mark Grim with his X-Hydro NAMBA class outrigger from the team Siesmic Amigos in southern California set a new US NAMBA SAW (straight away) average speed record of 126.192 MPH (203 kmh) in September 2008. 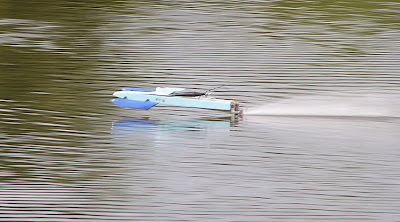 Thats the second fastest propeller driven RC boat ever! 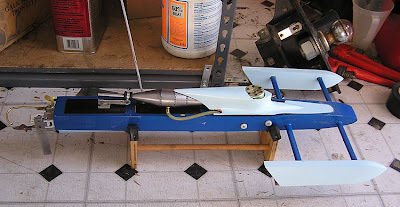 According to Mark himself in the International Waters forum he uses 67% nitro fuel mix, their own homebuilt rigger, a CMB 80 green-head motor and a prop by his son Chris.